Create a legally binding Indiana Bill of Sale with our attorney-drafted template! What Is an Indiana Bill of Sale? An Indiana bill of sale is a written document that transfers legal ownership of the described item from the seller to the buyer. Certain types of Indiana bills of sale must be notarized. The purpose of notarizing the bill of sale is to certify that both the buyer and the seller are providing true information to the best of their knowledge. Although an Indiana bill of sale isn't legally necessary for every item that is sold, it is an excellent way to document a sale for your personal records. What Are Some Common Bills of Sale Used in Indiana? In Indiana, the most commonly used bills of sale include a general bill of sale, a bill of sale for a motor vehicle, a bill of sale for a boat, and a bill of sale for a gun. How Do I Write an Indiana Bill of Sale? To write an Indiana bill of sale, you need to add the full legal name, physical address (including city, state, and zip code), and driver's license number. If one or both parties do not have a valid driver's license, you can also use the identification number on a state ID. Depending on whether you're drafting a general bill of sale, a bill of sale for a motor vehicle, a bill of sale for a boat, or a bill of sale for a gun, you'll need to add specific information. That information is discussed next. For an Indiana general bill of sale, you need the legal name, physical address, and driver's license number of both the buyer and the seller. The bill of sale should also include the date that it was created. You should add a thorough description of the item that's being sold. If the item has a serial or registration number, that should be documented in the bill of sale. For example, if you were selling your old laptop, your description might include the make, model, and size of the laptop. You might include the screen size, whether you're including the power cord, and whether the laptop has a DVD or CD drive. Next, you'll add the purchase price or information about anything that's being traded in. For a purchase price, you'd list the amount first in words and then in numbers. For example, four-hundred and twenty-five dollars and zero cents ($425.00). If the item is being given to the buyer as a gift, that should be disclosed in the bill of sale. 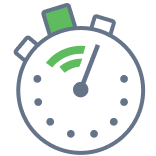 If the buyer isn't paying for the item on the same day that the bill of sale is created, you should include the date that the buyer will pay for the item. An Indiana general bill of sale should also include any additional terms of conditions of the sale. You should also add a seller's disclosure that informs the buyer if there are any known defects. The bill of sale should be signed and dated by both parties. There is no legal requirement to have an Indiana general bill of sale notarized although you may certainly elect to do so. The Indiana Bureau of Motor Vehicles provides State Form 44237 for a bill of sale for motor vehicles. For motor vehicles, an Indiana bill of sale should have the legal name and physical address (including city, state, and zip) of both the buyer and seller. The bill of sale must have the VIN; year, make, and model of the vehicle; the purchase price; and the date of the sale. An Indiana bill of sale for motor vehicles must have a certification by both the buyer and the seller that the information provided is true to the best of their knowledge. Sellers are also certifying that there are no liens and that they are transferring all of their rights. 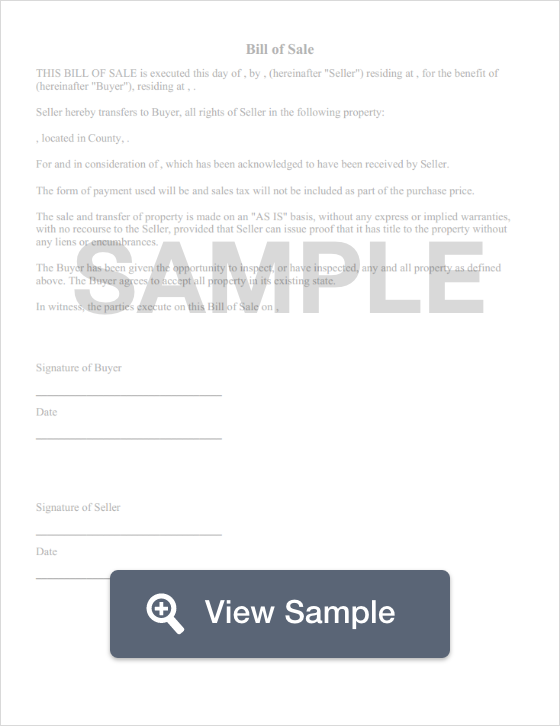 The bill of sale must be signed and dated by both the buyer and the seller. The bill of sale provided by the State of Indiana doesn't require a notary. However, if you draft your own bill of sale, it wouldn't hurt to have it notarized after you've ensured that your draft has all of the elements as listed by the Indiana Bureau of Motor Vehicles. An Indiana bill of sale for boats is provided by the Indiana Bureau of Motor Vehicles. In fact, it's the exact same bill of sale that's used for motor vehicles. The document requests the Hull ID; year, make, and model; and the registration number. A bill of sale for a boat must also include the purchase price and the date of the sale. An Indiana bill of sale for boats must have a certification by the seller that includes their signature, printed name, date, and address. This certification essentially states that the seller is signing over their interest and that there's no lienholder. Their signature affirms that the information they are providing is true to their knowledge. It also has the printed name, address, date, and signature of the buyer. The buyer is certifying that the information they've provided is true to their best of their ability. Before you sell a gun to another person, you should review Indiana gun laws. While you're not legally required to perform a background check if you're not a licensed dealer, you are legally prohibited from selling or giving a gun to someone who was convicted of certain felonies, is a drug addict, is an alcoholic, or is mentally incompetent. You can be charged with a felony. An Indiana bill of sale for a gun must have the legal name and physical address (including city, state, and zip code). An Indiana bill of sale for a gun should have the make, model, caliber, and serial number of the gun. Next, you should list the purchase price. If there is a trade involved, the item being traded for the gun should be detailed. Is an Indiana Bill of Sale Required to Register a Vehicle? Yes. Indiana Vehicle Bill of Sale Form 44237 must be completed by the buyer and seller before the motor vehicle can be registered. You'll also need to complete the Odometer Disclosure Statement Form 43230, provide a copy of your insurance verification, title information, and provide a copy of your driver's license. You may need more documentation depending on your specific circumstances. Residents of Indiana have 31 days to register their vehicle, but it cannot be driven on any state roads or highways until it is registered. Those who recently moved to Indiana have 60 days to register their vehicle, but the vehicle may be operated during that time period as long as its out of state registration is current. Is an Indiana Bill of Sale Required to Register a Boat? Yes. Indiana Vehicle Bill of Sale Form 44237 must be completed by the buyer and seller if the boat must be registered. To learn more about which types of watercraft are exempt from registration, visit the Bureau of Motor Vehicles website. When you register your boat, you should be prepared to pay the associated fees and taxes in full. Is a Bill of Sale Required to Register a Gun in Indiana? No, a bill of sale is not required to register a gun in Indiana. This is because gun owners are not required to register their firearms with the state. However, the State of Indiana does require you to have a license if you plan to carry a handgun on your person. Create a free Indiana Bill of Sale in minutes with our professional document builder.